I'm back! My daughter is happily married and life has slowed down a bit now, so I am ready to to blog again. Boy do I love this time of year! We have had the most beautiful fall; The trees are just now turning their brillant colors, the air is crisp and there are pumpkins decorating almost every porch. I love just about anything made with pumpkin, so I deciced to make pumpkin cookies for the first time. Why I haven't made them before now, I don't know. I usually make bars, bread or pie and stop there. But I've added these delicious cookies to my recipe box now. these Pumpkin Cookies are cake-like, soft and moist, and topped with addictive cream cheese frosting. I made these and took a platter full to a meeting I went to and they were devoured quickly. It's hard to eat just one of cookies. I dare you to make these and eat just one! Here's the recipe. Mix butter, sugar together until smooth. Then add the agg; mixwell and add the 1 cup pumpkin. In another bowl, stir together the dry ingredients. Mix the dry ingredients with the pumpkin mixture in 2 parts. Mix well. Dough is going to be very soft. I used a tablespoon to measure the dough for cookies. You can refridgerate the dough to make it a bit easier to handle, if desired. Scoop dough evenly onto baking sheets and bake in a preheated 350 degree oven. Bake 9-10minutes. Remove to a cooling rack and cool completly before frosting with the Cream Cheese Frosting. In a large bowl, cream the butter and cream cheese together with a mixer. Add the vanilla and then the powdered sugar, a little at a time. Mix until smooth and creamy. If the frosting is too stiff add a little milk or cream to loosen a bit. NOTE: I only used about half of the frosting on these cookies. But since the cookies are not very sweet, you may want to use more than I did. Pumpkins and cream cheese frosting sounds like a great combination! Yum! I've never done pumpkin cookies - and with the frosting - they are utterly delectable. Welcome back! Glad all is well in your neck of the woods! Welcome back Lynda! 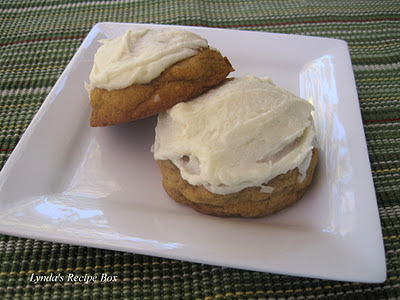 These look so delicious....I am sooo in the mood for pumpkin lately! Welcome back, Lynda, we missed your tasty recipes! I'm glad you're back....missed reading your post and recipes! 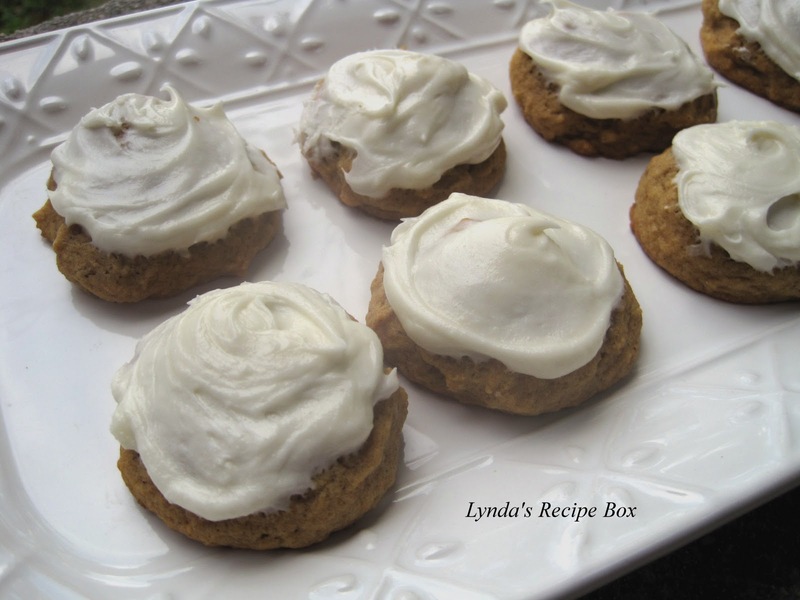 Its a beautiful time of year and perfect for these pumpkin cookies with icing. As soon as I saw them...I thought "Wow, these would be perfect with my morning coffee".. Thanks for sharing. P.S. congratulations to you on the marriage of your daughter, and getting back to normal. I tried pumpkin cookies last year and didn't like the recipe. Yours look wonderful....going to try them soon. The cream cheese frosting is perfect! When growing up in the 50's there was a delightful Grandma Marie across the street. She made cookies sooo similar to these that I just loved! They have may been a molasses-type but this sure sounds similar enough to try out!! Thank you Lynda!! Ah the 50's, such a good time! I hope these cookies are what you are looking for. Thanks so much for the comment too. Glenda, you can use salted butter; just cut the salt in recipes by half. It will be close.